Adesso combines productivity and comfort with the TruForm 150CB Desktop Ergonomic Keyboard and Mouse. The ergonomic split key zones, integrated palm rest, and gentle slope on this keyboard encourage a natural positioning of hands, wrists, and forearms, increasing maximum comfort for extended use. Furthermore, the contour and side grips on the ergonomic mouse are intended to alleviate hand strain. Beyond the ergonomic design, this duo is also built for productivity. Get instant access to commonly used internet and multimedia tools with 20 built-in hotkeys. This mouse features optical sensor technology that lets you work on most surfaces with improved speed and accuracy. There are also six buttons on this mouse, which includes a DPI switch to adjust different resolutions. The ergonomic, sloped shape and integrated palm rest keeps your hands in a natural resting position designed to relieve joint pain and improve posture. 13 internet hotkeys allow instant access to home, back and forward, refresh, search, favorites, sleep, wake, power off, calculator, my computer, music, and email. Operate the media player with the seven multimedia hotkeys, which include play and pause, stop, next track, previous track, volume up, volume down, and mute controls. The optical sensor technology lets you work on most surfaces including wood, glass, or marble with speed, accuracy, and reliability. You can adjust your dpi resolution for pixel accuracy or faster responses with the DPI switch button on top of the mouse. 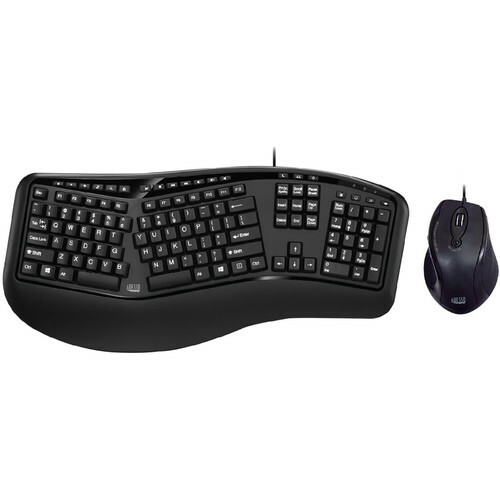 This mouse features six buttons, which include the left and right button, the scroll wheel, the forward and back buttons, and the DPI switch. Box Dimensions (LxWxH) 21.3 x 11.8 x 2.2"